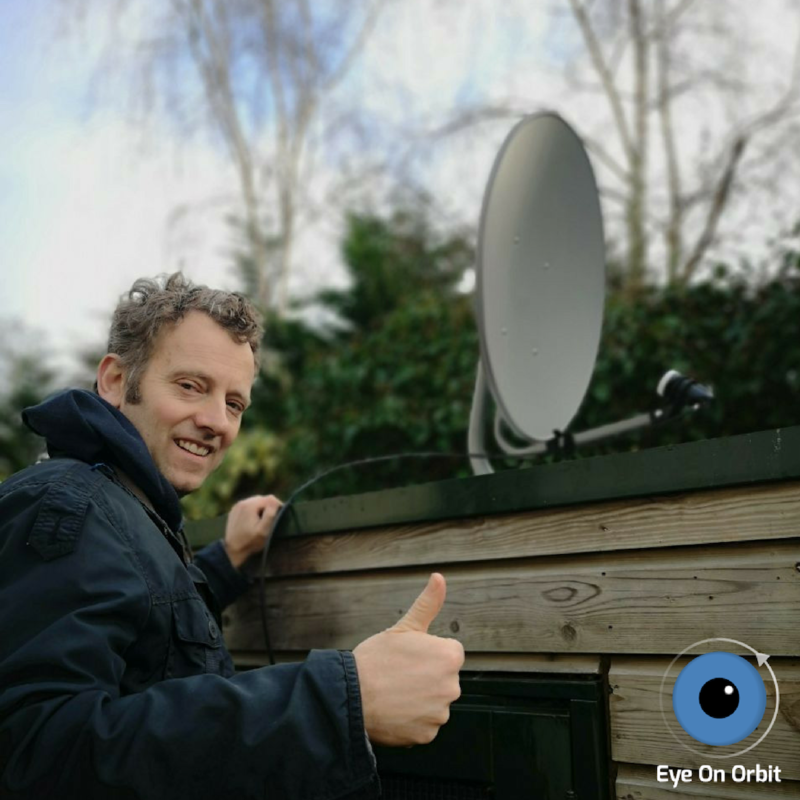 This blog documents the activities by Erik Laan to get Blockstream Satellite up- and running from the Eye On Orbit Headquarters in Delft, the Netherlands. 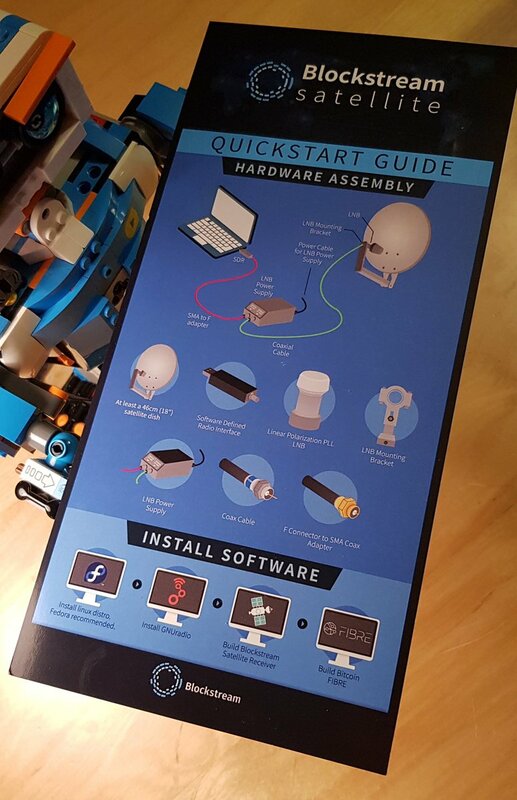 If you are interested too in setting up your own Blockstream Satellite connection, this link is a good start for the hardware part. This blog by Grubles can also be very helpfull! And last but not least, this Github page is simply the best! 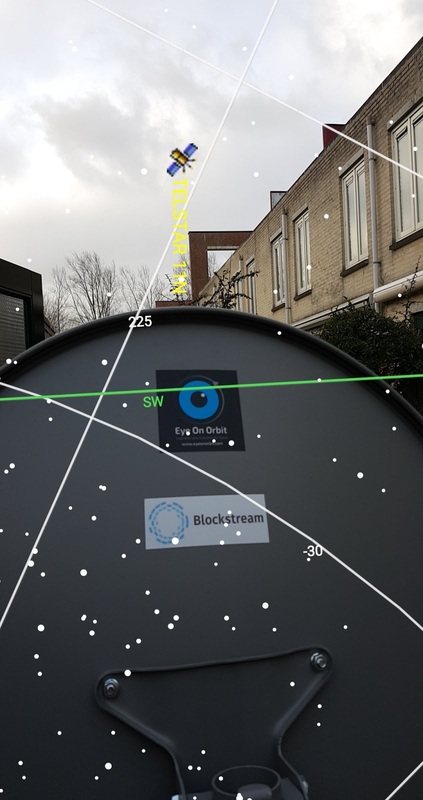 March 8, 2019: Have been epxerimenting with my DCSS LNB to get a good SNR with the Blockstream Satellite. Not succesfull yet. Am talking to my contact for the optimal settings to get it really working! Stay tuned! Another fun thing I did yesterday was feature in the BNR Cryptocast in which I explained what I have been doing with my Blockstream Satellite activities lately. Listen this podcast back here (in Dutch). March 3, 2019: Two exciting announcements! First of all, I received a new Low-Noise Block (LNB) downconvertor through a contact in the Blockstream Satellite slack channel. It is an experimental piece of equipment with a much better stability and lower noise than I had untill now. 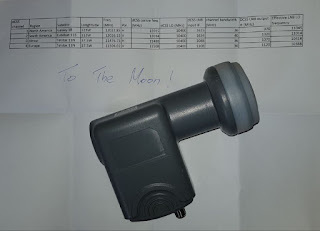 It's actually a DCSS LNB which basically means it down converts the microwave signals from the satellite in the usual way a normal LNB works. However it also does some processing. It can stack frequency 'windows' or transponders/channels shifting both the horizontal and vertical polarised signals to whatever frequency you want. This LNB has been programmed specifically for Blockstream Satellite. Will give it a try in the coming days! Secondly, I have been invited on BNR's podcast Cryptocast. With all respect to other Crypto podasts out there, this is probably the one with the biggest audience in the Netherlands on the Crypto topic. It's in Dutch so tune in on thursday March 7. I will be talking about my Blockstream Satellite adventures. Unfortunately I was not quick enough to send Samson my Lightning Network invoice through the epic Blockstream Satellite service, and have it globally broadcasted by 4 Geostationairy satellites around the globe, and onto Samson's dish. Pavol Rusnak beat me on the finish line and got hold of the torch. This triggered me though, to see if the Lightning Network could help me and my Space Education & Outreach activities. I am often approached by schools who would like to have me over to teach on Space, Stars and emerging technologies such as Blockchain, but often they don't have budget. I often have to say no, because I also have some mouths to feed at home. So I set up a little crowdfunding campaign on twitter through the Tippin.me service, and guess what, the tweet below embodies the asthonishing conclusion! This support in any case covered my expenses on February 13, when I visited a school and teached about Space & Stars! One of the Crowdfunding campaign supporters, Pan Tomuu, told me about the Zapread platform. This is truly a gem on a mission to disrupt the Social Media landscape. If you are reading this, you should really get a Lightning Network enabled bitcoin wallet on your phone like Wallet of Satoshi. Once you have it, ping me and as long as my funds suffice, I will send you some Satoshis! February 4, 2019: today was the Odyssey Hackathon Deep Dive in Den Bosch, NL where I gave a keynote on the the synergy between Blockchain and Space. Below is the video of my presentation. I have shared my Blockstream Satellite results with more than 500 blockchain developers in a church! Here is a link to a pdf version of my powerpoint presentation. January 26, 2019: since January 16, Blockstream has launched the Blockstream Satellite API. This Application Programming Interface is basically a set of Python scripts with which a user can broadcast his or her own data on a global scale, The receiving end is again the same satellite dish set-up that I have been using to receive the latest blocks from the bitcoin ledger. Of course ends must meet, so payments for this service are done through Blockstream's 2nd layer transaction protocol Lightning. For now, this is all in beta phase so untill the full testing of the API has not been completed you can also pay through the testnet, aka free of charge! I broadcasted a 'message from the stars' to celebrate this innovation. January 3, 2018: after last year's success of Acquisition Of Signal (AOS), there are still a number of hurdles to take. First and foremost is to improve the Signal to Noise Ratio (SNR) in the link budget. With further fine alignment of the azimuth and elevation pointing of the dish, and fine adjustment of the rotation of the LNB for the polarity, I managed to crank-up the SNR to get frame synchronization lock! 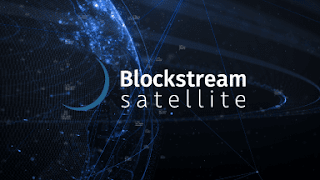 After some extra H/W and S/W fidelling, the data transmitted by Blockstream satellite Telstar-11N started to stream into my Linux machine and I got my first full header from a new block of the Bitcoin ledger! Unfortunately, the datarate is a bit marginal because of the limited link budget I am measuring (between 7 and 8 dB), so need to crank it up just a little bit to get it really up- and running. Will keep you posted on my progress. December 31, 2018: BREAKING!! 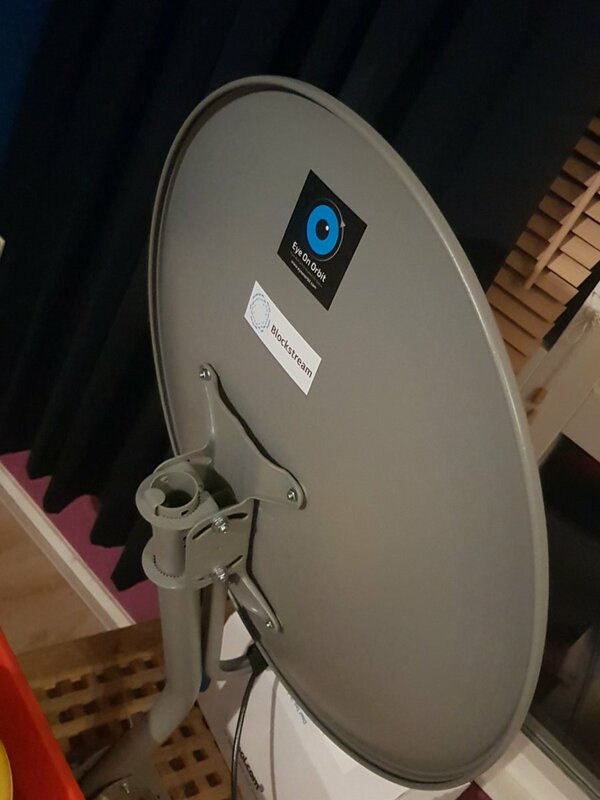 Acquisition Of Signal (AOS) with my dish pointing at the Blockstream satellite Telstar 11N. And here is the Spectrum before and after coarse frequency correction. Next step is to start streaming the data because I couldn't manage that yet. Now time to start celebrating the jump from 2018 to 2019! To all: enjoy the northern winter solstice holiday and a great start of the new orbit of our planet around that mainstream yellow star! December 30, 2018: took about a day to get the 200 GB of Bitcoin ledger synched on my laptop, through terrestrial internet connection. Also put the dish on top my shed and did some initial allignment with the celestial coordinates of Telstar 11N. So Acquisition Of Signal (AOS) has been delayed by one day! December 29, 2018: so Christmas is behind us so I can prepare some last things before I will try my first Acquisition Of Signal (AOS) from the Telstar-11N satellite tomorrow. I just compiled the Bitcoin Fibre software and I am now downloading the Bitcoin ledger of 200 Gbytes to have a faster initialization tomorrow. 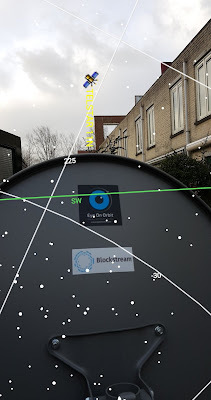 Also prepared the Bicycle shed Interface Plate-1 (BIP-1) for the expected elevation of 19 degrees that I need for the dish to be pointing at. December 24, 2018. Preparing the necessary move of my Blockstream satellite equipment from my home office in the attic, to our bicyle shed, I had to make a mechanical interface for the dish. This interface is now called BIP-1 for Bicycle shed Interface Plate-1. It is not weatherproof but should help out with the first Acquisition Of Signal (AOS). 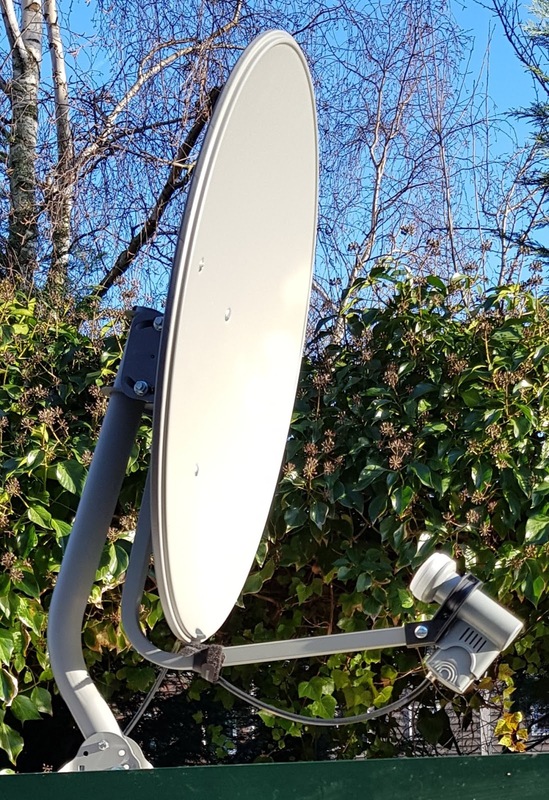 BIP-2 will be very solid, and actually, I want to be able to remotely point my dish to whereever I want. Somewhere before year's end I will see the Bitcoin ledger enter into my node with the help of BIP-1! Happy Winter Solstice and a good start of the next orbit of our planet around the sun for all my new crypto friends around the world! You can find my christmas card here. December 20, 2018. Functional testing successfull! I managed to hook up all the hardware: dish, Low-Noise Block downconvertor (LNB), the LNB powersupply, the Software Defined Radio (SDR) interface to my laptop, and a few tens of meters of rigid coax cables. My dish picked-up some noise as you can see in the picture below. Next step is proper placement and alignment of my dish. That will certainly be a new challenge. The tiny little balcony of my home office is pointing south and I should be pointing my dish to Telstar 11N at an azimuth of 228.66 degrees (more west than south) and an elevation of 19.06 degrees. It is gonna be solved but may take some more time, also with holiday season on the doorstep. December 19, 2018. My fight with Linux is finally over! After some last glitches with Fedora 27 iso files, I made the jump to Ubuntu 18.04 for which also Blockstream packages exist. Works like a charm. And nice to make the Space connection again. Ubuntu founder Mark Shuttleworth is a true space explorer! In 2002, at 28, he became the first African in space—and the second-ever space tourist—after spending millions to fly to the International Space Station as a member of the crew of Soyuz mission TM-34. Now it is time to hook-up the hardware and get in contact with the Telstar 11N satellite. December 18, 2018. Great news from Blockstream. They have added capacity from a fifth satellite to also cover Asia and Australia! Great promovideo hit the internets, see below. Funny to see that the fantasy Saturn-V rocket in the video carries an interesting interstage separator, that after being jettisoned, forms the Blockstream logo in the sky! December 17, 2018. Exciting news, I will be giving a keynote on the intersection of Space & Blockchain at the DutchChain Tech Deep Dive at the Jheronimus Academy of Data Science, Den Bosch, The Netherlands. I will be talking about my experience with Blockstream Satellite but also on the broader context of Space and Blockchain. And, I will be picking up my new laptop for proper Linux Fedora 27 install in Leiden! December 12-16, 2018. I found out that running a persistent Linux installation with Fedora 29 from a USB thumbdrive did not really work well. The sluggishness of my laptop was extreme, to a point that it seemed to hang, but 15 minutes later it executed the mouse-click I did, so really no-go! I found out that I would actually be better of with Fedora 27 given some precompiled Blockstream stuff I will be needing, so I gave a new go at installing a persistent Fedora 27 on my USB thumbdrive, again with no success. Then I understood I could also try to run it under a Ubuntu 18.04 Linux distribution, but again, these installations really don't seem to work well with USB drives, at least that is my experience now. Now on the look-out for a separate computer to install persistent Fedora 27 on the internal harddrive, as I don't want to end-up with a dual boot of my current work Windows 10 laptop. Probably lucky tomorrow! December 11, 2018. Satellite dish up- & running! December 10, 2018. Unboxing the package. Below is YouTube video of Japanese colleagues who made a promotional video about setting up Blockstream Satellite. This will be my goal! The activities described in this blog are made possible by the Bitcoin Space Education Fund (BSEF).